Practice Ignition tracks in-app and client actions so that you can be notified when they happen. Examples of these actions include proposals being created, sent and accepted. These notifications are displayed in the top right hand corner of the screen with a 'bell' icon. These notifications are within Practice Ignition only, you will not receive separate email notifications for these events other than the standard email notifications of accepted proposals, and comments on proposals. 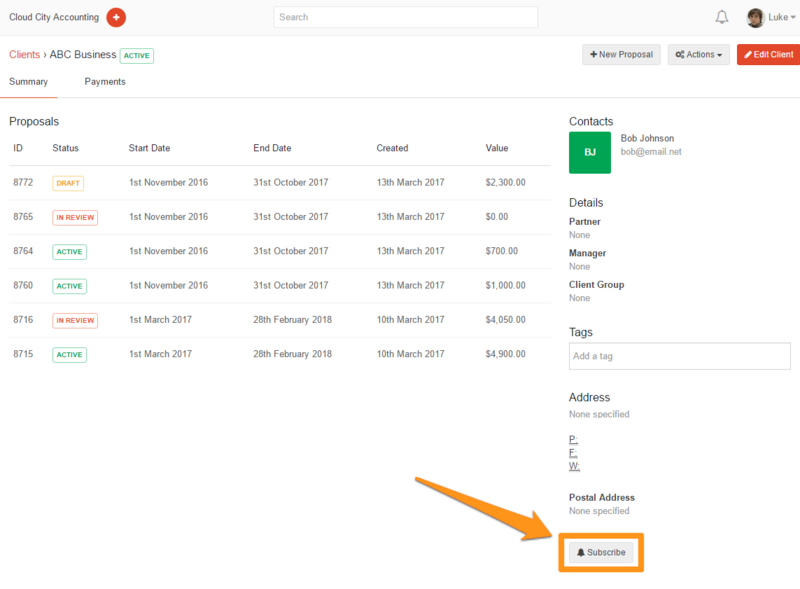 You can also manually subscribe to any single proposal, or proposals of a particular client. We recommend you configure your Default Subscription Settings first, then you can subscribe to any of the Automatic Subscriptions. You can access these settings by clicking on the notifications bell, and then clicking on the cog icon. You can also access the Notification settings by going to your profile by clicking on your name in the top right hand corner, then clicking My Profile. 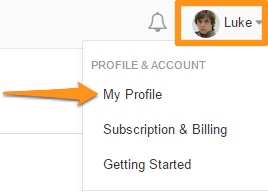 From your profile, select the Subscriptions tab. 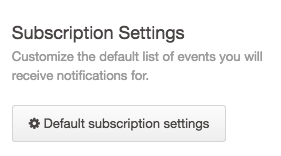 From here, click the Default Subscriptions Settings button to configure what events you want to be notified about. This will open a slider from the right hand side where you can tick the events you want notifications on. Once you've configured these settings, you can subscribe to any or all of the Automatic Subscriptions, and they will use your default settings. 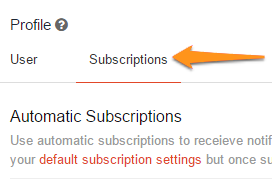 You can also edit the settings of each of the Automatic Subscriptions by clicking the Edit button once you've subscribed. You can also subscribe to specific proposals or all proposals for a specific client. To subscribe to a proposal, simply click the Subscribe button on the proposal. To subscribe to all proposals from a client, click the Subscribe button on the client page.